The national flag at Pahalgam. 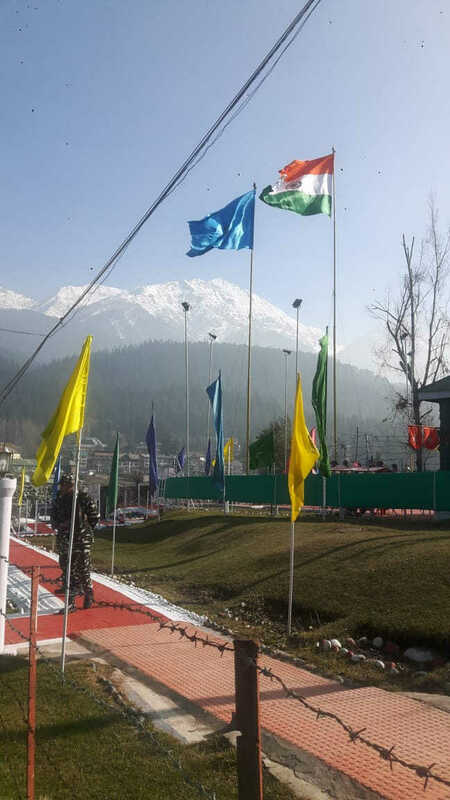 The militancy-hit south Kashmir is playing host to one of the tallest Tricolours in the Kashmir valley.The Tricolour has been hoisted 68 feet high by the Central Reserve Police Force (CRPF) at the headquarters of one of its battalions at the famous tourist resort of Pahalgam in Anantnag district. “This is the highest Tricolour in Kashmir,” said Inspector General (IG), Operations (Kashmir), CRPF, Zulfiqar Hassan. He unfurled the Tricolour at Pahalgam on December 1 along with the 63-foot-high CRPF flag. Hassan said the move was aimed at encouraging tourists to visit the Valley. “Kashmir’s basic industry is tourism and now people, especially tourists, feel that it is unsafe. But if we have the national flag and the CRPF flag flying high in one of the most popular tourist destinations of Kashmir like Pahalgam then people will know that there is normalcy and it is safe to come to Kashmir,” the IG said. The famous hill resort of Pahalgam also serves as a base camp for the annual Amarnath yatra.